BUTLER TOWNSHIP, ADAMS COUNTY, Pennsylvania (WPMT) -- A peaceful day kayaking turns into something that could be straight out of a horror movie for a father and daughter in Adams County, Pennsylvania. When you go kayaking you may expect to see some wildlife, but you probably don't expect to come head to head with a rabid beaver. That's exactly what happened to a father and daughter spending time on the water in Butler Township. "Get away cause it's a beaver!" screams Dan Wherley. "Get the f*** away. Get away you mother f*****!" "Half way through, I had to get my phone out cause nobody's gonna believe this, a beaver biting my kayak!" explained Wherley to FOX43 Thursday afternoon. 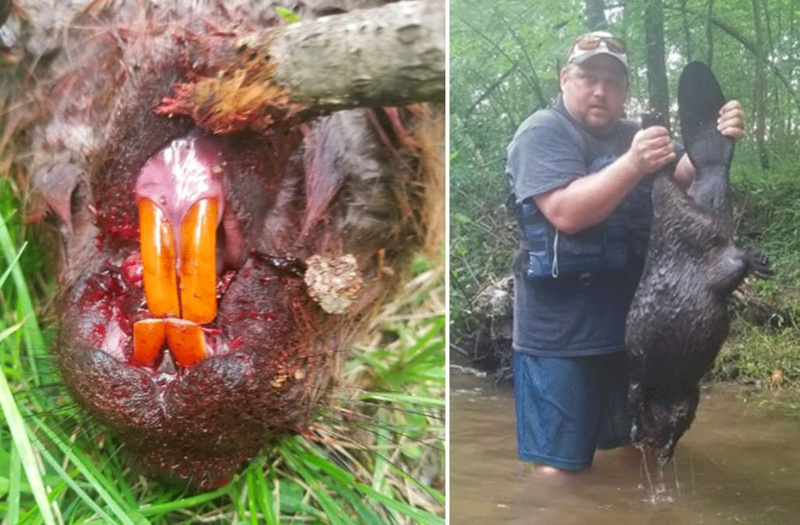 Wherley and his 7-year-old daughter Layla were kayaking on the Conewago Creek with their dog Ellie May when things took a rather rare and terrifying turn - a relentless beaver scratching and biting Wherley's brand new kayak. "I looked, and it was a beaver scratching at it, and I thought 'wow, that's pretty cool- a beaver came up to us! It wouldn't stop, so I used my paddle tried to hit it to get it away, and it just wouldn't stop, would't stop," explained Wherley. Realizing the beaver wasn't giving up, Wherley used what he had on hand. "I hit him with this a lot, but once I knew he wasn't stopping, I pulled it in half and was holding it like this and hitting him with the metal part. I figured that would do more," he added. It finally let up and went straight for little Layla. "The beaver came up to the kayak, and tried to get in the kayak," explained Layla. "I jumped out of my kayak and ran to her. I got to her kayak the same time the beaver did, it climbed up on the back of her kayak, started to, and I had to punch it to get it off, cause I didn't have anything with me," said Wherley. "How'd you feel?" asked FOX43. "Scared. The beaver was going to chew my kayak," explained Layla. Eventually, the fight went to shore, where Wherley killed the beaver. The Pennsylvania Game Commission confirmed to FOX43 the beaver had rabies, and since, Wherley's had to get a number of shots. "I was just worrying about her getting bit. That would've been horrible. I couldn't imagine," said Wherley. Layla's now understandably scared to get in a kayak but says she may try one day soon. As for dad, he says he'll definitely be keeping an eye out the next time he's on the water. "Well, it found us. We didn't find it. It found us," he described. People wondering what the dog did? Well, Wherley says it sat in the bushes, hiding. Officials say this is the first time there's been a rabid beaver in Adams County.